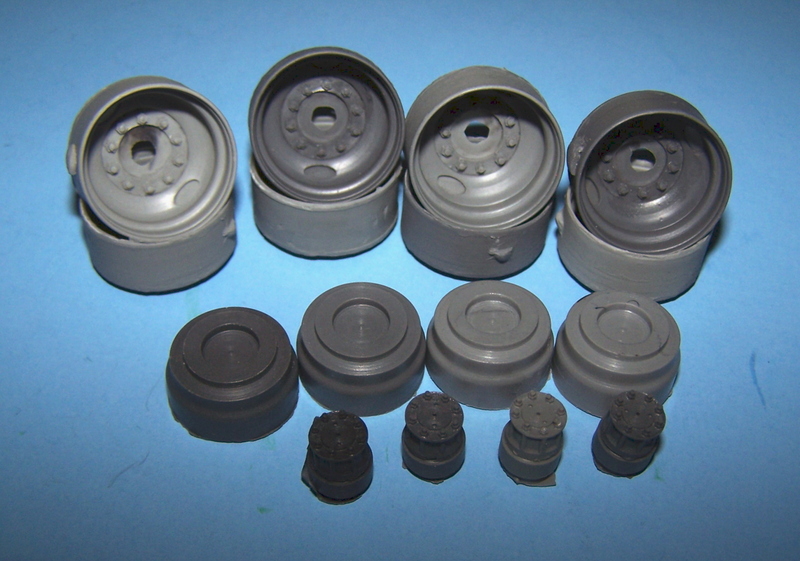 Resin cast tires and wheels. 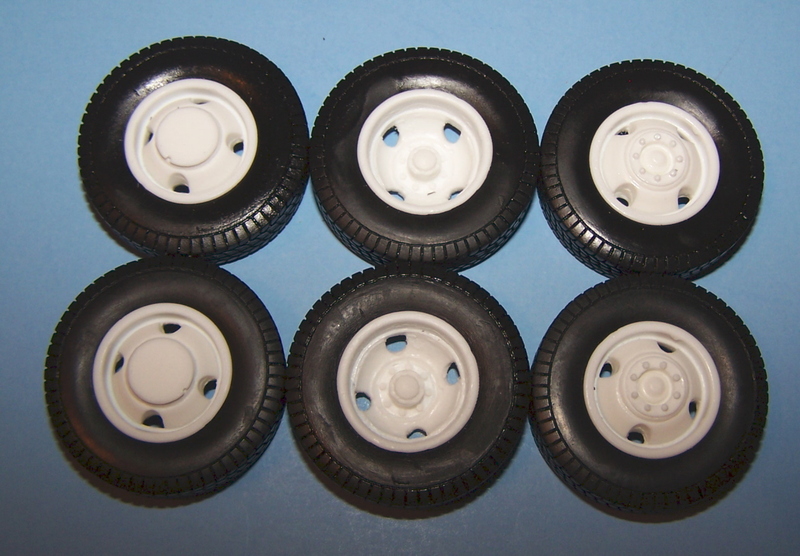 Set of 4 low profile trailer tires with 4, 10 hole wheels and 2 trailer hubs. 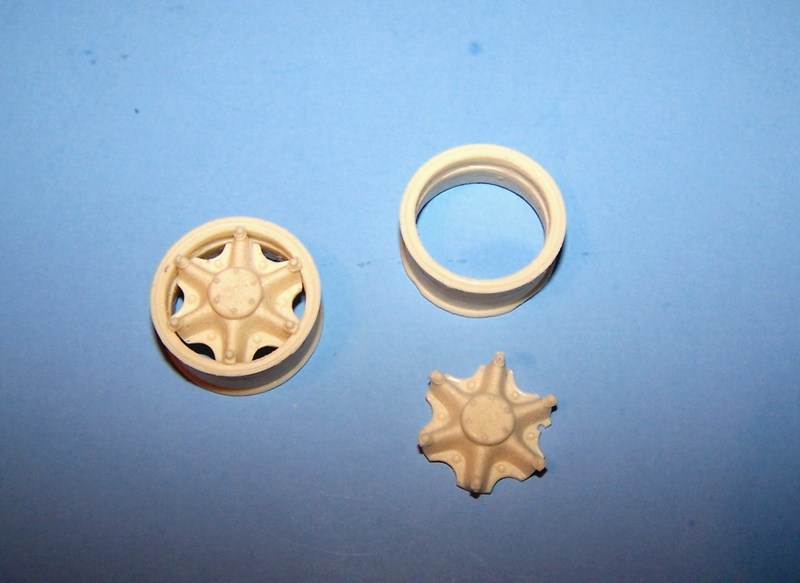 May be converted to Lo-Pro drives with the use of Mo'Luminum drive hubs or drive hub covers. 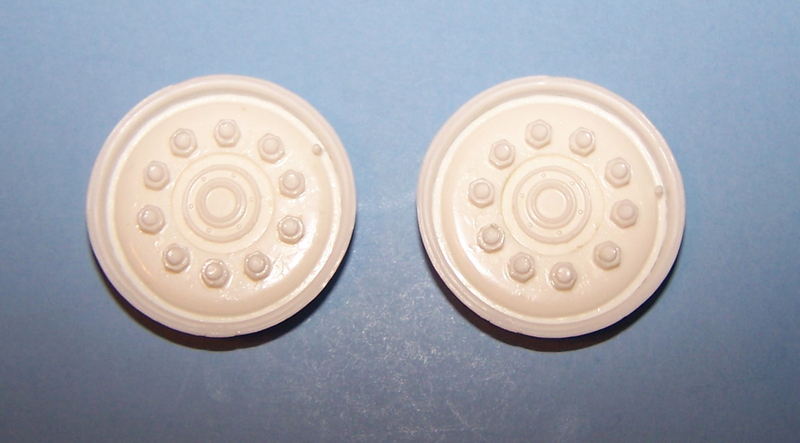 Set of 2 front wheels for use with driven front axles (4WD/6WD) Requires R199 or AMT/Ertl 22" backing rings. 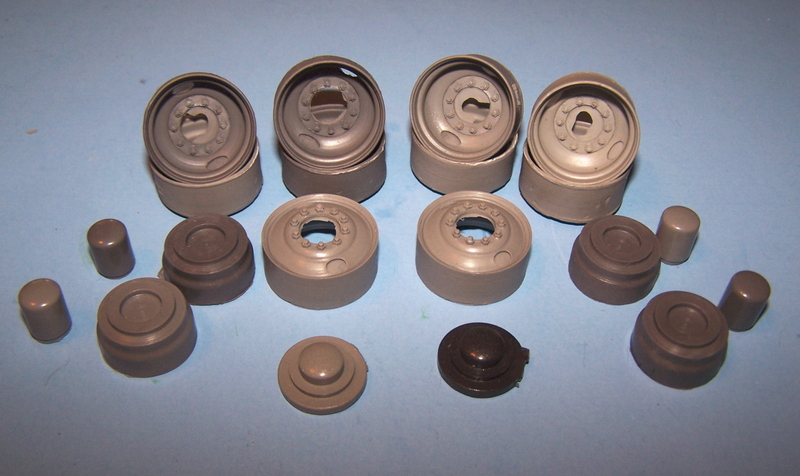 For use with AMT/Ertl or Plaskit 22" tires. 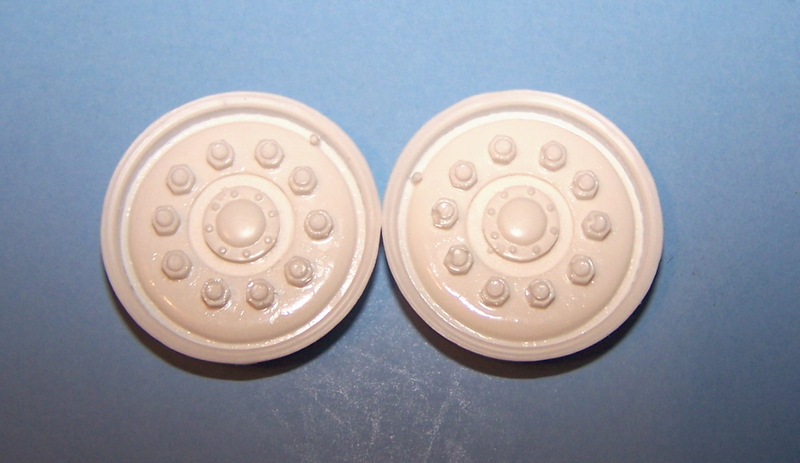 Set of 2 front wheels, requires use of R199 backing rings or AMT/Ertl 22" backing rings. Includes 8 wheels, 4 trailer hubs and 4 brake drums. 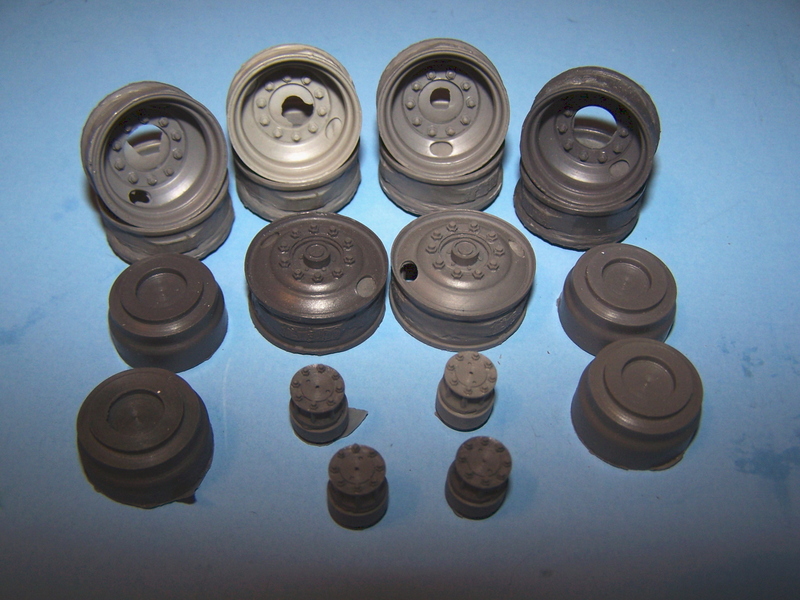 For use with 20" AMT tires or 20" JRR tires. Includes 8 drive wheels, 4 drive hubs and 4 rear drums. 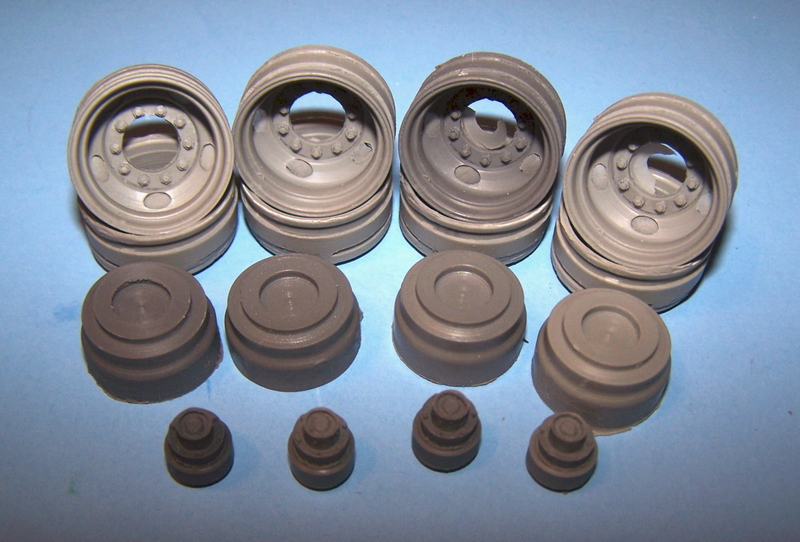 Complete set of wheels for 3 axle truck. Includes 8 drive wheels, 4 drive hubs, 4 rear drums and 2 front wheels with hubs. 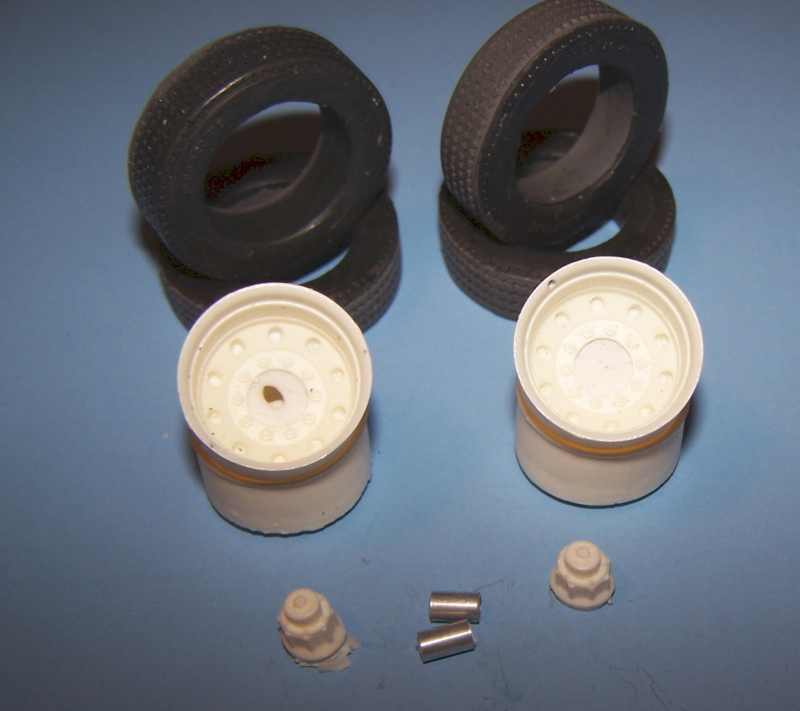 For use with 20" JRR tires or 20" AMT tires. Includes 8 drive wheels, 4 rear drums, 4 rear hub covers, 2 front wheels and 2 front drum/hub cover. 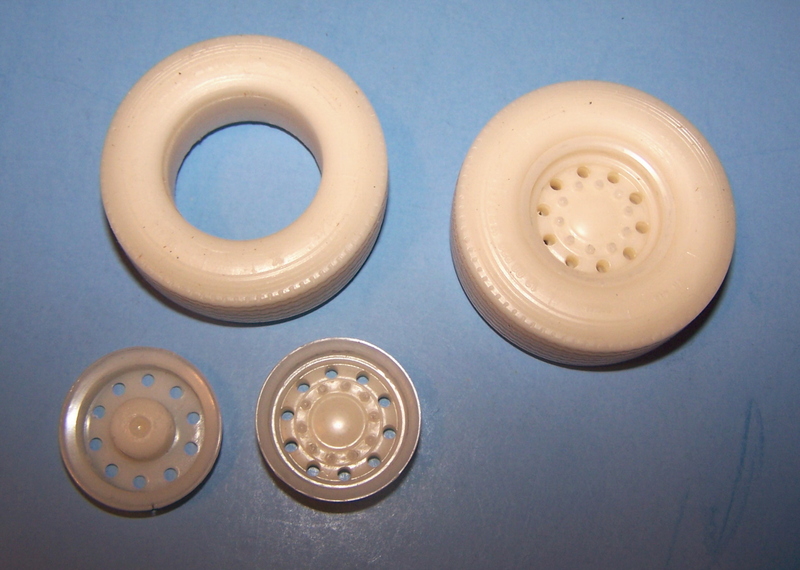 For use with Italeri vinyl tires. Includes 8 rear wheels, 2 front wheels, 4 rear brake drums, 4 rear hub covers and 2 front brake drum/hub caps. For use with MoLuminum 22" tires. Includes 8 wheels, 4 drive axle hubs and 4 brake drums. 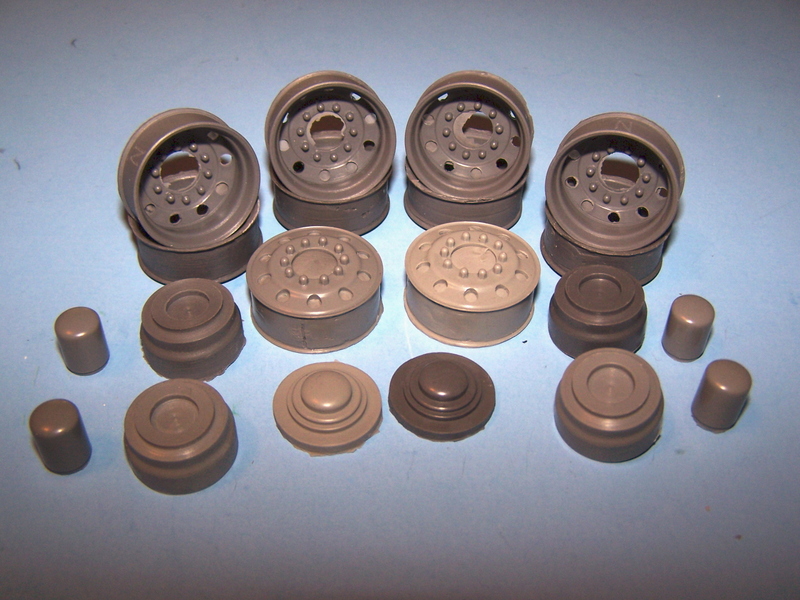 Full set of drive wheels for tandem axle truck. 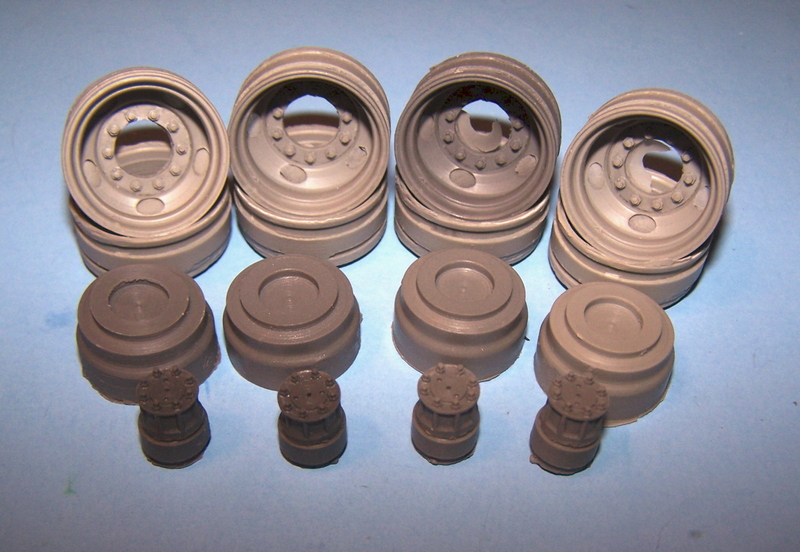 Includes 4 wheel centers, 4 outer rims with spacers and 4 inner rims with brake drum detail. Includes 2 wheel centers and 2 rims. 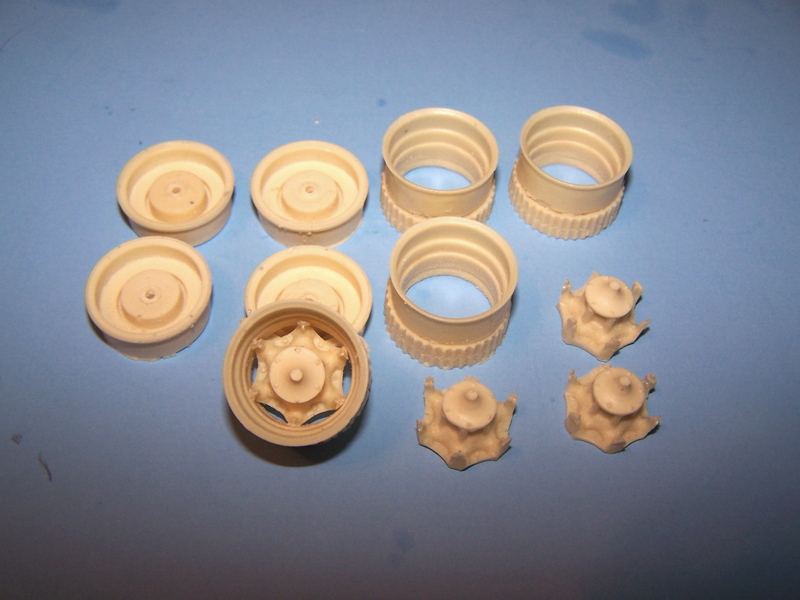 Set of 4 drive wheels. For use with Plaskit 22" super single or wide base tires. 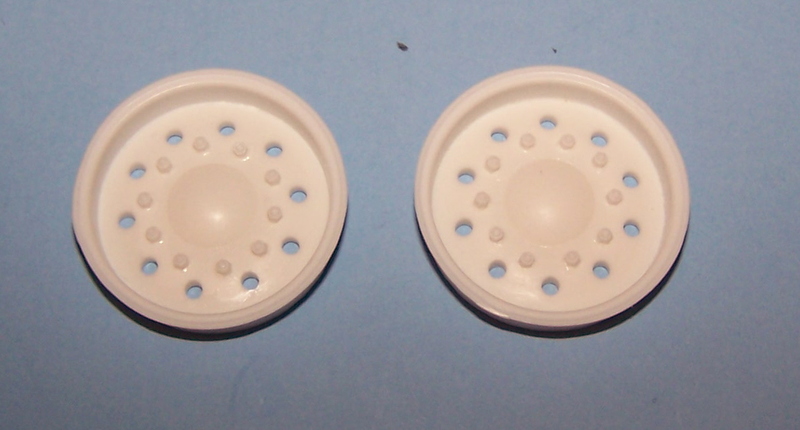 Set of 2 front wheels. 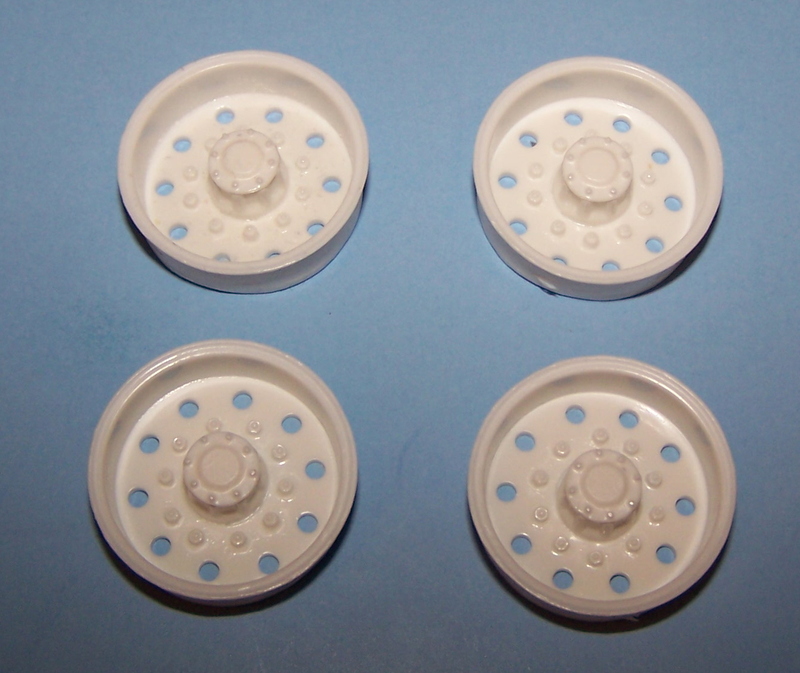 Wheels have 3" positive offset, for use with AMT/Ertl or Plaskit 22" flotation tires.